Josiah Wedgwood II is credited for inventing this beautiful and popular form of Transferware. But other experts think it happened by accident when the cobalt oxide escaped its boundaries during firing or glazing. These pieces were sold as “seconds,” and enjoyed a short-lived craze among the English. 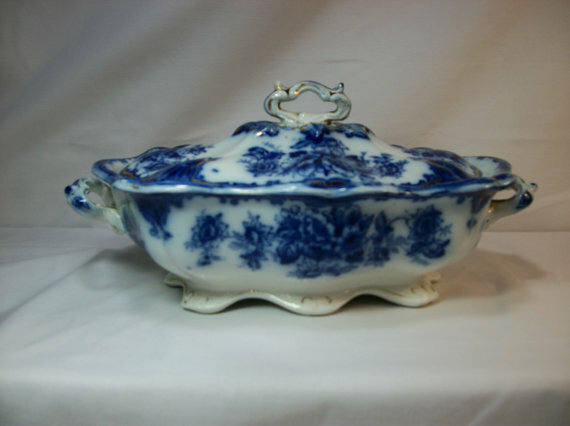 Americans loved it at first sight, and they snapped up Flow Blue as quickly as it could be shipped, from 1840 – 1870. Soon, the Dutch, Germans, French and American manufacturers produced it, until its popularity waned around World War I. Flow Blue (also spelled Flo Blue) pieces are highly collectible and valued for their distinctive blurred, flowing designs and vivid cobalt blues. Asian: Temples pagodas and people in traditional Asian clothing. The earliest motifs for Flow Blue. In the late 1960s and early 1970s, interest in antique Flow Blue regained momentum, and the market responded with cheap Asian reproductions. The 1980s were famous for these fakes, and the wise collector will learn to distinguish the old from the new. Look for the same features as with other Transferware. 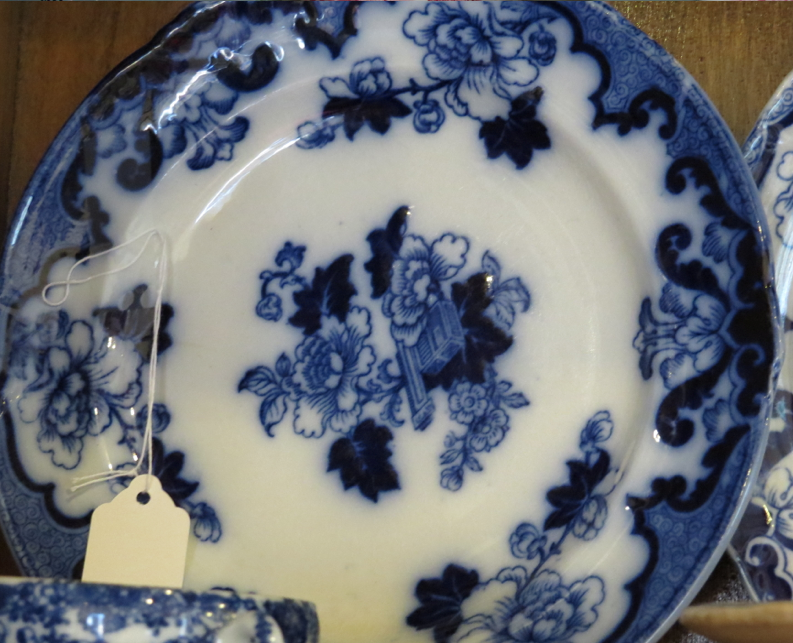 Antique Trader provides a comprehensive look at old and new Flow Blue. UPDATE: “Real or Repro” just published a fake mark for the Iris and Waldorf patterns. There’s also an excellent article by Dolores Monet that gives a comprehensive history of Flow Blue. Old or new, Flow Blue is still a lovely way to decorate your table! This entry was posted in Porcelain, Transferware and tagged brush stroke Flow Blue, Etsy, fake Flo Blue, fake Flow Blue, Flo Blue, Flow Blue, genuine Flow Blue, Janvier Road, Japanese Flow Blue, Josiah Wedgwood, transferware, Treehouse Antiques, value of Flow Blue, vintage Flo Blue, vintage Flow Blue, vintage transferware, Wedgewood. Bookmark the permalink.